The 2016 edition of Mesa County Libraries One Book, One Mesa County will present a tasty lineup of special events in February and March centered on “Kitchens of the Great Midwest,” the debut novel of author J. Ryan Stradal. The novel is a coming-of-age story about an orphaned girl with extraordinary culinary abilities. Mesa County Libraries will host a smorgasbord of events, book discussions, and films related to themes in the novel. The One Book, One Mesa County celebration culminates in a public presentation by Stradal at 7 p.m. Saturday, March 5, at the Avalon Theatre. The novel’s main character is Eva, who was orphaned at a young age and finds herself in a world of caring people who largely do not appreciate or know what to do with her almost superhuman sense of taste and imaginative palette that allows her to conjure up incredible food. The book follows chapter by chapter, ingredient by ingredient, the journey Eva’s gift takes her on. Events begin Thursday, Feb. 4, with a panel discussion titled “The Upper Midwest and Its Scandinavian Influences.” A discussion on Thursday, Feb. 11, will focus on “The Science of Taste,” examining how different foods and spices combine to create flavors and how wine and beverages enhance the total experience. On Tuesday, Feb. 16, “The Adoption Process: Impacting Individuals, Families, and the Community” will look at how adoption changes a child’s life and how and why people research details of their adoption. On Tuesday, Feb. 23, a panel will discuss “Local Foods: From Farm to Plate.” Another panel of food and literature experts will present “A Literary Look at ‘Kitchens of the Great Midwest’” on Tuesday, March 1. Book discussions open to public participation are scheduled during February at various Mesa County Libraries locations. For a complete schedule, please visit your local library or mesacountylibraries.org. A complete list of One Book events is available in the One Book guide, available at all Mesa County Libraries locations, or online at mesacountylibraries.org. All events are open to the public at no charge. “Kitchens of the Great Midwest” is available in multiple formats at Mesa County Libraries in hardback, large print, and audiobook. Several copies also are available for checkout in e-audio and ebook formats. All you need is a library card, available at no charge at your nearest Mesa County Libraries location. One Book, One Mesa County is sponsored by Mesa County Libraries, the Mesa County Public Library Foundation, the Daily Sentinel, and KKCO 11News. For a complete list of events and other information, visit the main web page for the 2016 One Book, One Mesa County celebration. J. Ryan Stradal lives and works in Los Angeles, Calif. He grew up in the Midwest, in the southern Minnesota town of Hastings, and graduated from Northwestern University. His first novel, “Kitchens of the Great Midwest,” was published in July 2015 and reached The New York Times Hardcover Bestseller List at No. 19 on its third week of release. So far, “Kitchens of the Great Midwest” has been acquired for publication overseas in 10 countries. The Pirate’s Alley Faulkner Society awarded “Kitchens of the Great Midwest” first prize in their annual novel competition. Stradal’s shorter works have appeared in a variety of publications. He works as fiction editor at The Nervous Breakdown and as an editor at large for Unnamed Press in Los Angeles. He was editor of the 2014 California Prose Director, an anthology of writing about California by California authors in 2014. He also has edited and produced shows for television. For more information about Stradal, visit jryanstradal.com. 2016 marks the 12th and final year of One Book, One Mesa County. The event has enjoyed much success due to selections and authors that entertain, illuminate, and inform readers, as well as the related discussions and experiences that bring the books to life. “Kitchens of the Great Midwest” is yet another high-quality selection that will act as a wonderful finale for One Book. Mesa County Libraries wish to thank current and past One Book Committee members for their service and expertise, the sponsors whose support of One Book has been invaluable, and especially everyone in the community who has participated in One Book in any capacity through the years, whether as a reader, an audience member, a panel member, or in another role. We hope One Book has been as enlightening, interesting, and fun for everyone else as it has been for those who worked diligently each year to create a top-notch community event. Thank you. All events take place at the Mesa County Libraries Central Library, Fifth Street and Grand Avenue in Grand Junction, unless otherwise noted. Join us for a broad conversation about the upper Midwest, especially its Scandinavian-American culture. The panel features two Midwesterners with Scandinavian ancestry: Dr. Brenda Wilhelm, a sociologist from Wisconsin and Minnesota, and Dr. Erika Jackson, a historian from Michigan. Dr. Isabella Kasselstrand, a sociologist from Sweden, will compare this culture with that of contemporary Sweden. Explore the reasons why humans taste, how different foods and spices combine to create flavors, and how wine and beverages enhance the total experience. Panelists include Josh Matteson, wine manager at Fisher’s Liquor Barn; Dr. Kelly Craig, assistant professor of biology at Colorado Mesa University with a specialty in mitochondria; and Wayne Smith, a certified executive chef from the Culinary Arts program at Western Colorado Community College. Learn about our amazing local food variety from Matt Chasseur, executive chef at High Lonesome Ranch; Josh Niernberg, executive chef/owner of Bin 707 Foodbar; Blaine Diffendaffer, owner of Blaine’s Tomatoes and Farm; Erin McIntyre, features reporter and Home and Garden columnist at the Daily Sentinel; and Robin Brown, owner of West Slope Events and organizer of several successful pop-up dinner events. Since “Kitchens of the Great Midwest” came out last summer, the book has received much praise and has been on many “Top Reads of 2015” lists, including Amazon’s best 100 books of the year and an Editor’s Choice book in The New York Times. Join three experts in a discussion of the literary merits of the book: CMU English professors T.J. Gerlach and Jennifer Hancock, and Brunella Gualerzi, owner and chef at Il Bistro Italiano. 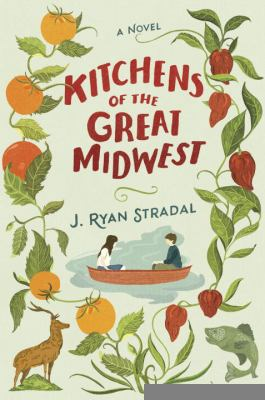 Hear J. Ryan Stradal, author of “Kitchens of the Great Midwest,” discuss his book. This event is open to the public at no charge, and a book-signing will be held afterward. Doors open at 6 p.m. Discussions of “Kitchens of the Great Midwest” are hosted by One Book Committee members and are open to the public at no charge. Share your thoughts about “Kitchens of the Great Midwest,” or just listen to learn more about the book. Palisade Branch, 119 W. Third St.: 10 a.m. Saturday, Feb. 27. Films related to themes in “Kitchens of the Great Midwest” are scheduled for 1:30 p.m. on the following Sundays: Feb. 7, Feb. 14, Feb. 21, and Feb. 28. All films will be shown in the Central Library Community Room. They are open to the public at no charge. For film titles and other details, please visit any Mesa County Libraries location.